A very simple single phase dc brushless motor driver electronic circuit project can be designed using NJU7365 DC brushless motor driver ic manufactured by New Japan radio Co. LTD . The NJU7365 is a single phase motor driver ic that include in package MOS FET motor driver , direct PWM input , FG output and thermal shut down circuit . The driver is capable of 1000mA maximum output current and continuous current of 350 mA . 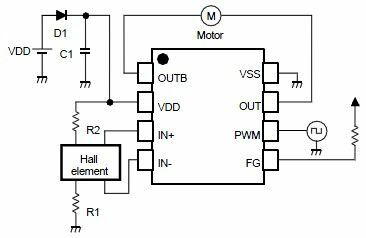 This motor driver require few external electronic parts and can be powered from dc power supply from 2 to 5.5 volts .